For many years the Bilbrook Railway Station signs were overgrown, faded and looking very sad. We decided that, as this was the first thing many visitors to our village saw, it was about time it was cleaned up. We contacted London Midland and they reset all the slabs around the sign ready for us to repaint the wording. 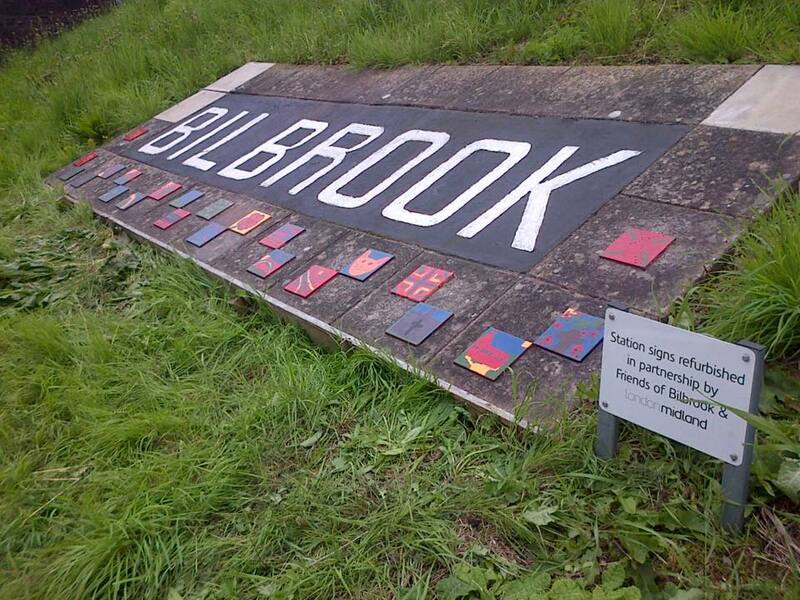 In April 2015 members of FoB cleaned and repainted the Bilbrook sign on both sides of the station, planted bulbs and wild flowers around the edge of the slabs and removed a couple of rotting trees. At the same time, we approached Bilbrook Middle School with an idea of children painting tiles to decorate around the Bilbrook signs. A group of year 8 children visited the station to get an idea of what was needed. Tiles were kindly donated by Topps Tiles in Wolverhampton, FoB provided the paint and varnish and Bilbrook Middle children provided the delightful images, all of which portray what Bilbrook means to the children. In July 2016 London Midland staff fixed the tiles in place and have repainted the station shelter. We’re sure you will agree that in partnership with London Midland, we have enhanced the station no end.